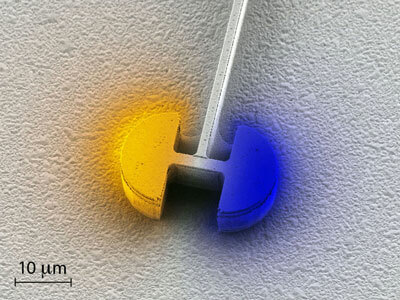 (Nanowerk News) ETH-Zurich physicists have developed a new kind of laser that shatters the boundaries of possibility: it is by far the smallest electrically pumped laser in the world and one day could revolutionize chip technology ("Microcavity Laser Oscillating in a Circuit-Based Resonator"). It took a good one and a half years from the idea to its inception; a time when Christoph Walther, a PhD student in the Quantum Optoelectronics Group at ETH Zurich, spent days and nights in the FIRST lab. This was because ETH Zurich’s state-of-the-art clean-room facility provided him with the ideal conditions to set a new record in laser technology: the physicist teamed up with four colleagues and developed the smallest electrically pumped laser in the world to date. It’s 30 micrometers long – that’s 30 millionths of a meter – eight micrometers high and has a wavelength of 200 micrometers. This makes the laser considerably smaller than the wavelength of the light it emits – a scientific first. After all, lasers normally can’t be smaller than their wavelength, the reason being that in conventional lasers light waves cause an optic resonator to oscillate – much like acoustic waves do to the soundbox of a guitar. In doing so, the light waves basically “travel” back and forth between two mirrors. The principle only works if the mirrors are larger than the wavelength of the laser. Consequently, normal lasers are limited in terms of their size. In developing their laser concept, Christoph Walther and some of his team mates under his supervisor Jérôme Faist, professor and head of ETH Zurich’s Institute of Quantum Electronics, were inspired by electronics. “Instead of the usual optic resonators, we use an electrical resonant circuit made up of an inductor and two capacitors”, explains Walther. The light is effectively “captured” in it and induced into self-sustaining electromagnetic oscillations on the spot using an optical amplifier. “This means the size of the resonator is no longer limited by the wavelength of the light and can in principle – and that’s what makes it so special – be scaled down to whatever size you want”. This prospect especially makes the microlaser interesting for chip manufacturers – as an optic alternative to the transistors. “If we manage to approximate the transistors in terms of size using the microlasers, one day they could be used to build electro-optic chips with an extremely high concentration of electronic and optic components”, says Christoph Walther. These could one day considerably speed up the exchange of data on microprocessors.